This weekend friend and fellow bunny lady Chris of Woolybuns came down from Connecticut so that we could travel together to the rabbit gathering at Avillion Farms in North Carolina. Along the way she had adventures and delivered bunnies, and I was glad to see her coming in with my beautiful Pufflet! 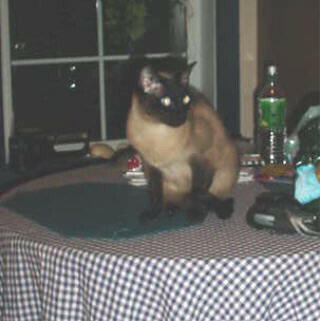 More about him, with pictures, in my next post! A pleasant trip down through North Carolina passed with only a little mild confusion, mostly my fault. We knew we had reached Elaina's lovely farm when we saw the delightful little Shetland sheep and Angora goats in the fenced pastures around her home. Susan of Storybook Dreams Rabbitry and Elaina were there to greet us, along with Elaina's three delightful Siamese cats. We sat around the kitchen table catching up on stories and getting acquainted with the cats, looking forward to the big weekend. Elaina, gracious hostess that she was, gave us free run of her spacious house and fiber stash! We started Saturday with a tour of Elaina's rabbitry, admiring her herd of Germans, German crosses and French angoras. We learned how she deals with the heat and humidity of her area and saw her hanging cage system. She described each rabbit and we discussed the color and examined body types against the German standard. 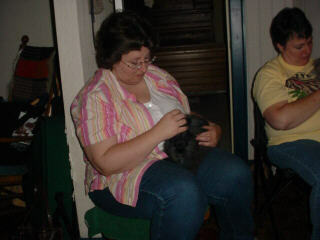 Elaina has extensive veterinary knowledge and shared many of her experiences with past and present litters. Before it got too hot she did a shearing demonstration on the back porch of her house. 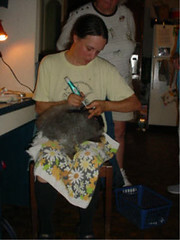 Elaina showed us how to shear a rabbit on a grooming stand, with scissors, and how to sort the fleece. By this time there were eight of us present for the seminar and everyone was intent on seeing everything we could of the process! We then came inside for Chris to demonstrate the lap method of shearing. Both bunnies were happy to lose their thick coats and we learned some good tips on shearing and rabbit handling! With these two experienced shearers, each bunny was free of his wool within a hour or so, content to sit happily free of the heavy coat and be admired. Elaina had been wanting a lilac buck for a long time, and a beautiful one finally showed up in my Greenberry's Autumn Joy's litter with Delly's Delight Quenten. 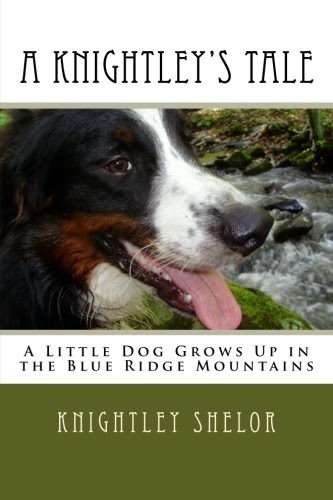 So little Purple Passion traveled down to North Carolina with us to meet his new mom. Elaina was very pleased with him and brought him in to show off. The little guy enjoyed meeting all the new people and was content to be cuddled and admired. In between demonstrations and instruction the group discussed many of their experiences with Germans as knitting needles flashed, busy with projects. 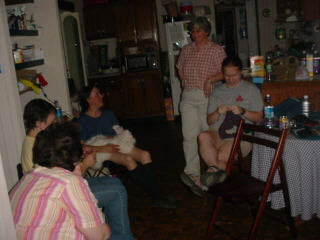 It was interesting to hear about a house bunny that lived with Carry and about different rabbitries and their management from the other women. Karen brought charming little socks made from her dyed angora that were so soft and just too cute. Everyone brought a spinning or knitting project, seemed like. I started a crocheted scarf from pure angora in natural black. Another bunny came down with me to go home with Karen. This bunny, from a litter between Living Water Farms Angel and ISeeSpots Elwood Blues, is a sweet natured, fuzzy-faced little buck that was also happy with all the attention paid him. 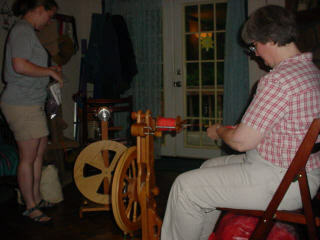 Jan of Jan's Giants in Western Pennsylvania purchased a Kromski wheel from Chris and picked it up at the meeting. We enjoyed seeing such a beautiful wheel and it was fun to put it together and see how much Jan loved it at first sight. 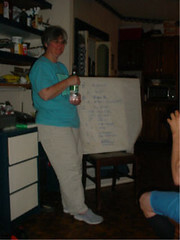 According to her blog, Jan has already christened the wheel! Nice to know she made it home safely; she arrived on Saturday morning after driving all night. After a very full day, it was nice to settle down with my scarf for a little while and crochet while Robin and Chris were spinning. Susan was knitting and a cat found his way to my lap and settled down. 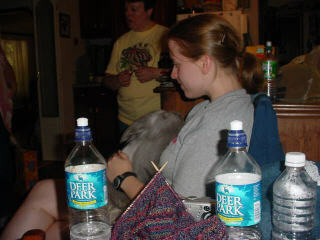 As usual, the talk was flowing, and Elaina joined us with a rabbit in her lap to shear. She seemed to really like the lap method that Chris showed us. After the rabbit was clipped we went out to dinner, one of the many times we were immoderate over the weekend with food! Sunday dawned warm again and we went out to breakfast after a good night's sleep to charge up for the day. A visit to see the Angora goats was fun, with all of us admiring her beautiful silver buck. The goats, like all of Elaina's animals, were friendly and content. I was amazed to learn that she shears her goats and sheep herself. 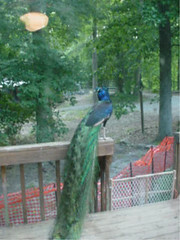 The peacock paraded on the house as we came back up, and the shyer hen moved along under the trees with the bantams. We even watched a box turtle near the house. I love all aspects of working with the bunnies, but the one thing I don't enjoy is tattooing. The tool that I use is a clamp device with needles shaped like the letters to be tattooed into the rabbit's ear. I numb the ear as much as I can but sometimes the bunnies act like it isn't a pleasant experience. But I hadn't been able to spend lots of money on the less traumatic tattoo pens I had heard about. But Elaina sat down with a bunny and showed us her method of tattooing with a new tattoo pen that she recently purchased. I think everyone was totally impressed with this tool, sold at a reasonable price and so much less traumatic than the clamp system. Elaina's expertise with the tattoo pen was even more impressive as she worked on two young rabbits to show how clear the resulting tattoo could be. She also corrected an earlier tattoo that had become illegible. The cleanup was easy and the rabbits didn't even flinch throughout the quick process. My order went out this morning! The high point of the weekend was a basic genetics seminar given by Chris Morgan. She showed us the ABC's of rabbit color genetics and related the information to questions we had about our individual herds. We learned the shoulds and should nots of breeding different colors together to get the best color strength in crosses and hybrids. Chris is a fine instructor and we diligently took notes and discussed our herds and breeding plans. She made it easy to see why it was so hard to achieve some colors and patterns and had us practice identifying colors by genotype. I have struggled with genetics since high school but I'm finally getting an understanding of some of the important points, thanks to Chris! The weekend had to end at last, of course. We picked up a bunny that Chris was taking back for a visit to her rabbitry and headed north, talking about the wonderful time we had shared. There was such an attitude of sharing and helpfulness, with such generous people that were so giving of knowledge and experience. Everyone had something special to contribute, from showing off wonderful angora pieces that they had made, stories of interaction with Germans on every level from pet to breeder, to the valuable expertise of the breeders that had been working with Germans for years. It was a diverse group but we were united in our love of the German breed and also by the attitude of sharing. I hope everyone had as wonderful a time as I did! Elaina's hospitality was much appreciated by me and I'm sure everyone else, and I enjoyed getting to know her so much better. And meeting new people and old friends, all very special. As we traveled up toward Virginia, I missed a turn and we continued past our exit. Philosophical and needing a stop anyway, we turned into a gas station lot to take care of the needs of body and vehicle. 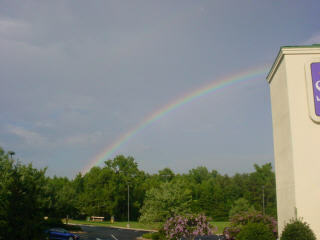 Rain was falling as we went in but we came out to see a beautiful rainbow in the skies above the town. A lovely end to a special experience!